On sale from February 18 - $5 each - Pre-purchase today!!! The Queensland floods crisis touched us all with stories and pictures we will never forget. To mark this historic event, Gatton Star alongside its sister publications across Queensland, has produced a special keepsake. From Friday February 18, a 68-page commemorative book will be available for just $5 (plus $2 postage & handling) from leading newsagents. 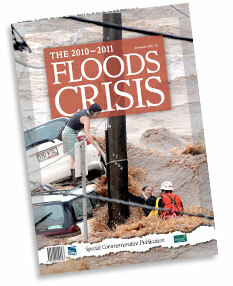 We will donate $1 from every book sale to the Premier's Flood Relief Appeal. Reach out and show you care. Secure your book by pre-purchasing a copy today. Simply order and pay online by credit card to receive your commemorative book in the post. Click below to purchase your copy or visit our participating Newsagents to purchase your copy.